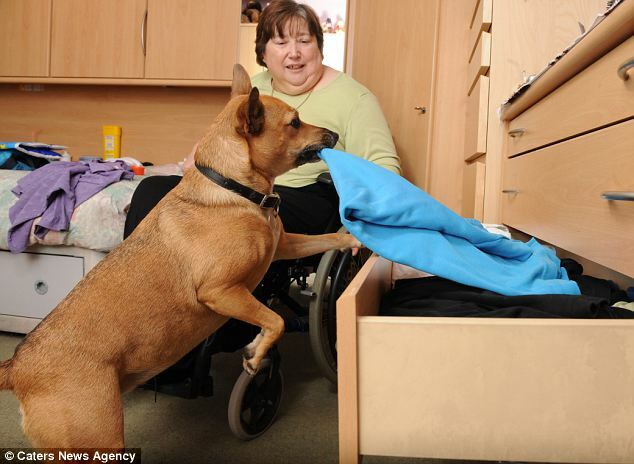 Four-year-old Sandie has proved she really is a girl’s best friend – by learning to do all of her owner’s housework. The four-year-old pooch does all of owner Sue Line’s shopping and washing – and can even pay for her groceries. The Terrier-cross accompanies Ms Line, who is paralysed from the waist down, to the supermarket – putting all of her shopping in a bag, which she then carries around in her mouth. When they come to the checkout Sandie can even take money from her owner’s purse and hand it over to the shop assistant. Sandie also loads the washing machine – separating her dirty clothes into dark and light loads and locking the machine door before the cycle begins. She has also mastered how to unlock the kitchen door to let herself out to the toilet – and always remembers to close it behind her on her way back. Ms Line, a retired NHS health trust manager, was paralysed 40 years ago after she was thrown from a car in a New Year’s Eve smash. The 61-year-old from Coventry, said: ‘My life has become so much easier since I’ve had Sandie helping me. She’s such a clever dog and has given me a sense of independence that I never had before. ‘I have lost some of the use of my hands, so Sandie’s help with fetching and carrying things is invaluable to me. Sue bought Sandie when she was just a few weeks old, from a friend – and hoped that her new pet would provide her with some companionship. But it was only after getting in touch with a dog charity – Dog AID (Assistance in Disability), that she realised Sandie’s full potential. Ms Line added: ‘Sandie’s mother was a very intelligent dog, and that’s obviously a trait that’s been passed on. ‘None of us ever imagined just how clever Sandie would turn out to be, though. ‘I’m lucky to have a caring and supportive family around me, but it’s great for me to have Sandie so they can have a bit of a break. ‘It’s lovely to have such a wonderful companion, and for me to regain a bit of independence. People we meet out in the street are always amazed by her. My local shopkeeper has got used to her doing the shopping for me and handing over the cash, but it’s always funny to see other people’s faces when they watch her do it for the first time. ‘Sandie and I were out shopping a few weeks ago when a woman in front of us dropped some change. ‘She couldn’t believe her eyes when Sandie picked up the coins in her mouth and gave them back to her. It took about two years to train Sandie to do all the things she can do now. ‘The hardest bit was getting her to ignore food when we go into restaurants – she’d always be drooling when she smelt something delicious – but she’s an absolute star now. 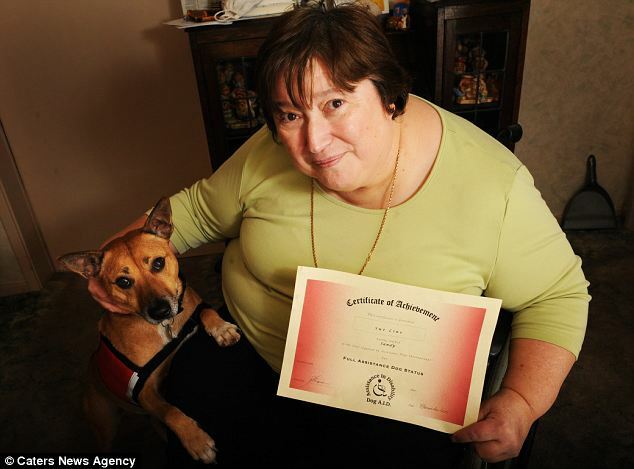 Sandie is one of 24 dogs that have been successfully trained by Dog AID – and has recently been awarded their highest award. Sandra Fraser, the charity’s co-ordinator, said: ‘Sandie is absolutely brilliant. She’s a real success story. 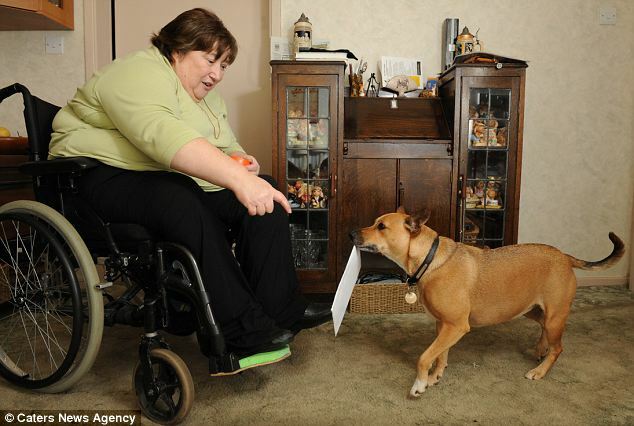 ‘Most people don’t think of a Terrier cross breed when they picture a support dog – but Sandie does just as well as any Labrador. ‘She has made a huge difference to Sue’s life.